Oh boy, this week’s meeting offers an interesting agenda including a few ‘twists’ to items and issues that have previously been before Council. There are some clear recommendations from Staff on a number of items. It will be interesting to see how Council responds. Nothing of interest here, only a request for a Tag Day and no scheduled deputations. A Clean Air Day request as well as a request for a Tag Day to support a baseball association. 9.1.1 – Staff is recommending that Council approve adding a link to the ‘Stop the Drop’ website from the town’s website. Seems reasonable given the critical nature of the low water situation in Georgian Bay and its impact on residents and businesses. 9.1.2 – the CAO is recommending the town forgo development of a by-law to permit the operation of all terrain vehicles on Parry Sound streets. The key issues underlying this position are: policing costs, public safety and maintenance costs. Apparently most communities that have permitted some sort of ATV access to public streets are largely rural and expect this access to support tourism. There may be some future discussion of allowing ATVs to have access to selected commercial centres and perhaps a corridor through Parry Sound to connect trails. 9.2.1 – Staff is suggesting that a home owner’s request to change their water service from metered to unmetered (‘flat rate’) be denied. I don’t think the town installed meters to have them uninstalled. The only reason an individual would want to move to a flat rate is because they feel it will be cheaper, as is the case here. It is my understanding that average users actually save money with a meter, which provides an incentive to conserve and install water saving devices, notably higher efficiency toilets (yes, they really do work as well as large volume toilets). It’s also a way to avoid issues of where a home is used as an unlicensed ‘rooming house’ and water usage far exceeds the norms. 9.3.1 – it looks as though the town has a buyer for the old pump house building (former Waterworks) for $242,000. Staff seems to support the offer. This new offer is a little bit surprising as there was only one low-ball offer received during the request for proposal period. It seems the individuals making the offer are looking for a quick closing and are satisfied with the property’s zoning for residential and limited commercial use. There is mention of a walk-in café and displays of memorabilia and local artwork. It seems like a good deal for all involved. It would be great if the property can be restored to reflect its important role in the history of Parry Sound. 9.3.2 – is a resolution recommending Council accept the proposal from Century 21 Granite Properties to be the listing agent for the Old Pump House. I was puzzled by this but realized that this is obviously a backup in case Council doesn’t approve the previous resolution (Item 9.3.1). It’s worth noting that Century 21 is willing to accept a 4% commission versus 5% as proposed by another real estate firm. 9.3.3 – the Smelter Wharf is getting some attention. This resolution covers some simple maintenance and repairs. The total cost is about $5,300. There is a separate resolution in the amount of $3,800 to inspect the wharf including an underwater review. These expenses are covered by a reserve fund that is funded by lease fees. 9.3.5 – the town is rescinding the sale of the two lots on MacFarlane Street that were approved at the last meeting. These lots do not meet the minimum by-law requirement of being at least than 100 meters from an odour producing facility (the water treatment plant). Rather than rezone the properties, Staff is recommending that the town abandon the sale of the two lots. 9.4.1 – the Director of Public works is requesting Council approve the purchase of two new trucks, one ¾-ton and one ½-ton. This may bring to an end Council’s recommendation that Public Works look into used vehicles. Good move in my opinion, there are better ways to save money than running around and buying used trucks. And I guess the new trucks will be ordered red. Let’s see if Council agrees, or offers to form a committee of Council to look for used trucks on their own personal time. 9.4.2 – this one is a big deal. Staff is suggesting that Council approve a proposal from Fowler Construction to design and rebuild the Smelter Wharf boat launch. The proposed cost is $42,530, about a quarter of the estimated and budgeted amount. And installation will take a week. Whoo-hoo, less money and earlier completion, this is a bargain (unless the original estimate was sandbagged, but I doubt it). Staff is recommending use of the boat launch be restricted to non-commercial uses to extend its life and reduce overall costs. Makes sense to me. In town businesses already have their own access to the water and out-of-town commercial users can contract with a local business to provide the necessary launch services. There is no way the town needs to subsidize non-rate paying businesses, especially at the expense of local rate-paying companies. 9.5.1 – Council is being asked to approve the negotiation a one-year contract for the town to provide by-law enforcement services to Carling and the Archipelago. 10.2.1 – this by-law will specify the 2013 ‘claw-back percentages’ for properties Parry Sound. That’s pretty much it. See you Tuesday. 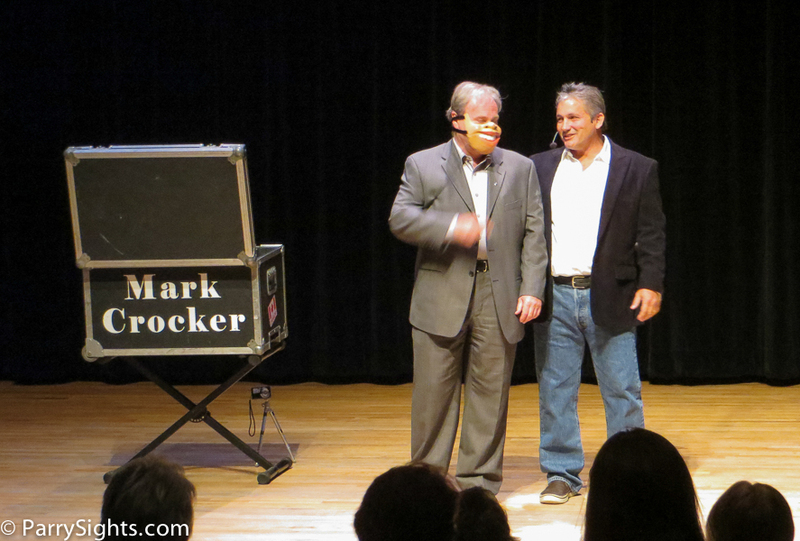 If you missed the Volunteer Appreciation show at the Stockey Centre with Mark Crocker, you missed a great show. This was a very nicely arranged thank you for the many town volunteers. The Mayor Get’s a New Voice. (Volunteer Appreciation Night, May 2013). Note: Not all agenda items are covered here. I typically skip items and details that have little material impact on the town. These items include simple requests for Tag Days (permission to canvas), Awareness Weeks/Months, road closures for civic events, and the like. Want to see everything that is on the agenda? The full agenda can be found at the town’s website (http://townofparrysound.com/pagesmith/14).